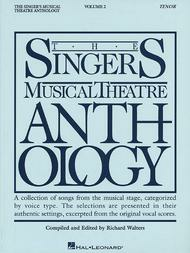 The Singer's Musical Theatre Anthology - Volume 2 - Tenor (Book only) (Tenor Book Only). For Vocal (Tenor Voice and Piano). Vocal Collection. Broadway and Vocal Standards. Difficulty: medium. Songbook. Vocal melody, piano accompaniment, lyrics and introductory text. 224 pages. Published by Hal Leonard (HL.747032).ISBN 0793523311. With vocal melody, piano accompaniment, lyrics and introductory text. Broadway and Vocal Standards. 9x12 inches.CD accompaniment available separately (HL.740234).